Personally I like this shoe a lot. I looked long and hard at the Gaviota and Elevon before going with this. My only other experience so far with Hoka has been the Mach. I've used Bondi's since 2012 and just ordered a pair of 6's last night. Hoping they are better than the 5 which didn't work for me. I think Dan's right to love on the Bondi, and to wonder why Hoka continues to mess heavily with its' bread-and-butter offering. That said, yeah, I think the shoe industry in general right now views "stability" as a dirty word. Considering where we were nine years ago with the explosion in minimalism, followed by the pendulum swing back in the other direction, we're not talking pronation really as much. We're looking for comfort, for platform stability, and for the shoe to get out of peoples' way. Brooks talked it up with Stride Signature - but you even see it with the way people call out posting on their shoes. They don't. They try to get any dual-density to blend into the rest of the shoe. Also - yeah, Reebok. When they've decided to spend money on specialty run, they've usually done it well. Under Armour is starting to reap the benefit of the work the Fritz Taylor did while he was there (Fritz is former of Mizuno/Nike/Brooks, now over at Descente). It'll be interesting to see if they continue to be interested, or if again, it dies on the vine. Which, to be fair, just about everybody thought Hoka would be put out to pasture with Deckers, and here we are. When buying the Bondi 6, I compared the specs against their other offerings, tried it on at a LRS against the Elevon and said I'm going with this. Bought it online since Hoka only has limited colorways at their retailers...literally taking away a sale from their retail partner. Yes, the color of the shoe matters to me lol. LRS work is tough. Especially forecasting which color to take in a particular model on futures orders versus what you'll accept for at-once availability, etc. All while making sure that you're only buying enough that you'll actually turn at a good rate. That said, the LRS should have been able to order a color for you, unless it was 100% exclusive (which is usually pretty rare). did you get to the finish? i like the shoe quite a bit. Yes I read the whole thing...the ominous start just throws me off a bit. I gave up on Hoka's with the Bondi 5 change and the rest of their lineup revamp. I was a huge fan but they blew it with all the changes. Thankfully I found On Running and am currently in love with their Flyer and Flow models. if you didn't like the 5, you can still safely buy the 6. the 6 rolls back some of the bad stuff in the 5, but keeps the good stuff (like a seamless upper). I don't work for a shoe company so I don't understand how they work; I'd love to hear from someone who does. It seems that a clear problem for many experienced runners is the constant major changes from one model of a shoe to the next. It would be like Ford releasing a new minivan, slapping a Mustang badge on it and trying to convince everyone that it's a sports car. It just makes no sense to fully redefine what a name badge means. I've tried reading the Hoka lineup on their website and I have almost no idea which shoe is for which purpose, running style, size/weight of runner, surface, etc. Baffling. 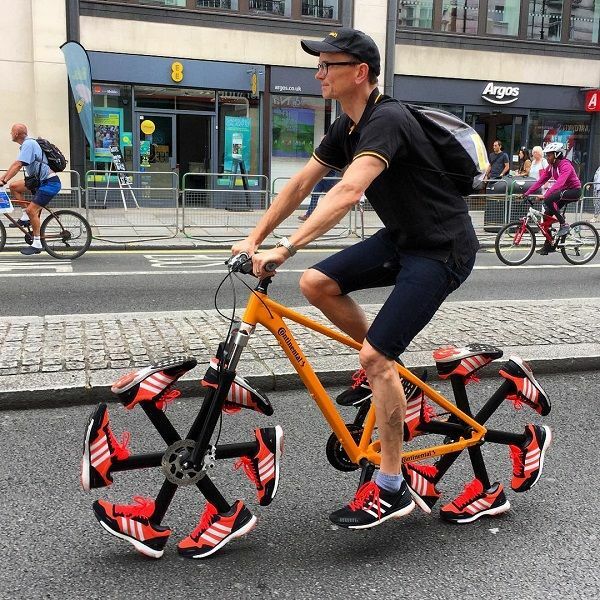 It's like the antithesis of cycling shoes. this is, in my opinion, a question of HOKA. my first contact with them was when it was owned by 2 frenchmen, the founders. i said, "you make a tri shoe". they said, "no we don't. we make a skyrunning shoe." and i said, "yes, i know what you think you make, but when you get finished perfecting that market, which won't take too long, call me, because with a couple of tweaks you make a really good tri shoe." and they called a couple of months later, and off the brand went. and, they understood what they were making. but then they sold it to deckers outdoor, who also understood tech running. but then all the upper management from deckers left, the entire HOKA division was replaced from the product manager up, and down, only 2 or 3 of the original people remain, and they don't talk to me, so i don't really know what they know and what they don't. it doesn't meant they don't know. just, if they do know, i don't see a lot of evidence for it. one came over from inov8, which is fine, but it is not HOKA in theme or style. i just don't know. i don't understand what they mean, or think they mean, by cushioned or stability, because i don't see the shoes accurately identified, in my opinion. so, there's nothing really to do but keep trying them, or maybe we'll try to do the job of accurately categorizing them for slowtwitchers according to our own view of which shoe does what. My first experience with Hoka was the Bondi B2. The thing I liked most about that shoe was how soft and bouncy it was; for my creaky knees it made the perfect shoe for long runs. Then the B3 ruined everything... The Hoka rep I talked to insisted that it was the same midsole but it most definitely was much firmer (or rather "more responsive"). Ever since then I've longed for the super soft feel that they don't seem to make anymore. I've since moved to the Skechers Ultra R2 for my super soft shoe as that seems to be the closest I can find to the feel of the old Bondi B2. I think there are a lot of people who remember the old days of Hoka who would really like to see a re-release of the original Bondi and Clifton V1 using that soft squishy foam that they used to use for a midsole. Here's a random thought - we all carry on about wind tunnel testing or friction test or rolling resistance for bikes. Is it feasible to devise some sort of industry standard running shoe test? Buy a pair of size 10s. Measure the clearances to a standard last. Determine toe room, length, heel fit, etc. Measure/calculate forces though the "foot", energy rebound %, effective suspension travel, durability/change in performance over time, etc. Is this too abstracted? Would it tell us anything useful? Interesting that impact forces went up for runners new to maximal cushioned shoes. It'll be interesting to see the results after they have been running in them a while. A couple comments on the article or really the second paragraph. Is Hoka on the board at other brands? - A resounding yes, they are. There are two brands mentioned that are simply copying the thick midsole that Hoka has. All the other brands are looking at the benefit to the runners and putting engineers to the task of figuring it out. I’ve consulted on one of the brands. If you look closely at their product coming out they are fully addressing some of the aspects of Hoka that are resounding benefits to the runner. One of the really big brands is putting the squeeze on potential growth for Hoka. From My view of running shoes I can see it happening and it started over a year ago. Hoka is growing so it’s even hard for them to see. But I can see where a runner who might have bought Hoka is not and is going with this particular brand. Triathletes a reflection of the total running market - I’m not sure what you are looking at Dan. I think it would be a good discussion in Kona this year. My view or my work shows a completely different picture. Brands - Boil it all down, a brand is a business. Hoka One One is a small business within a portfolio of brands. It has been set up to be one of the growth business for the parent company. In other words Hoka One One needs to be the major growth for the big company. There are many options for a brand to grow. There is a distribution plan at the brand and part of the distribution plan is growing overall business with current retail partners. To do that Hoka want’s to be a bigger piece of the running shoe wall. There is only so much growth with a current retailer through building a better Clifton. They have to do that but they need more of the shoe wall to really generate better growth. No different than any other brand of running shoes. i don't mind hoka becoming more than just a tech shoe brand. my concern is when it ceases to any longer perform its niche functions. and, i'm not saying it's failing at that. for example, there's one shoe it makes that never, ever, ever, ever goes on sale. they can't make enough of these. it's the tor ultra hi wp. that shoe kills it. and it's not a running shoe. hoka could kill it in the service sector: shoes for postal deliverers, restaurant service workers, and if you'll note you'll see the bondo and gaviota in leather, in black and white colors. i'm all for that! as well as i can tell, hoka is, what, a $175mm brand? and this is just a raw guess. i don't know. whatever size it is, it's that size as a pure tech running brand, with (last i heard) most if its distribution in north america. so, with all respect to nike pointing to $50bb, adidas at $30bb, NB at $4bb, brookshire hathaway at, what, $2bb?, asics @ $1bb? what do these companies do, in tech running, in the US? not boat shoes. not skateboard shoes. not disco shoes. hoka isn't making any money selling 1970s remakes to japanese hipsters, because it wasn't around then. if you just look at what's checking at the cash register in tech running, in the US, hoka can see brooks, asics, saucony, nike in the distance. it can see the lead vehicle. but it didn't get to this place by doing what brooks is doing. it got to this place by doing precisely what brooks isn't doing. being brooks is what it shouldn't do. brooks needs to be hoka, not the other way around. that said, let's talk about it in kona. i need to know what you know. My problem with Hoka is that they are ever changing. The original Bondi worked for me, but where they attached the the upper to lower part of the shoe ripped after about 30 miles. They were great about replacing it, but the replacement shoe had changed its sizing and my foot flopped around in it. I have tried several other pairs, most recently the “stable” Arahi. How much money can one waste on shoes that may not or do not work? Back to my Brooks. Yes, they change models too, but I have much better luck with their subtle changes. My new 6's arrived last night and I took them for an easy 7 mile spin this morning. I've gotta say so far so good. I'm not very good at recalling how past models felt and making comparisons but I can say that there was a very familiar bounce/cushion to the 6 that I really liked. Definitely much more so than the 5's. I have a pair of Clifton 4's that whenever I run in them I felt like I was rolling onto the outside of my foot. Wear in the sole confirmed it. Went to try on a pair of Nathans and they had the Clifton 5 so I tried it on and it felt completely different. I don't roll out any more, and they're my current go-to for training. I wouldn't be surprised if the next iteration changes back though. Can’t really argue with anything you are saying. I’ll be a great deal smarter when we see each other in Kona. My head is full of data from the spring including 2 US Marathons, 3 European Marathons and a hand full other US based events. Adding to that will be a marquee event from last weekend, a marathon in china and two middle distance events on the east coast. That is it. I might add colors and some widths, but those are the shoes I would make and they would always be the same. As a runner, I don't care if my shoes are 'updated.' I want to know exactly what I am getting. I have not bought a running shoe from anyone but Hoka or Altra for years, but I am close. What brand isn't ever changing...I've found "that" shoe multiple times only to have it never again especially with the big brands like Nike who manufacture like 400 different run models. I would prefer it be more like bikes I guess...spend two years working on the next model, but this year we'll do more colorways.